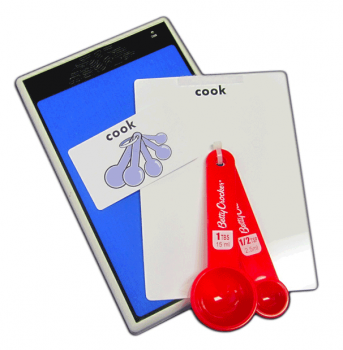 The Logan ProxPAD choice maker is a single location communication and learning aid for persons with physical, visual, or cognitive impairments and require tangible objects or other site cues to initiate communication. The ProxPAD uses RFID (radio frequency identification) and gives a voice output and responds to touch or proximity frequency. The Touch mode requires your hand or sound tag to make contact with the blue surface of the ProxPAD while the Proximity mode allows you to swipe the sound card above the surface making it perfect for the person who has limited mobility or needs the ProxPAD mounted under a table or wheelchair tray. This package comes with the Logan ProxPAD and a pre-made 50 piece set of Tangible Object Cards sized 5”x7” that include a corresponding removable sound tag. This package is perfect for the visually impaired or blind or persons who have additional disabilities and/or lack a formal means of communication or literacy.